Most of these old tractors that are offered for sale have been neglected for several years before the owner decided (or was convinced) to sell. 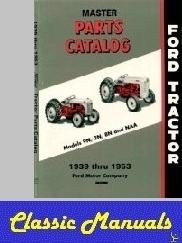 Even if you have purchased a "restored" tractor, it takes very little time to go through the various systems. No engine can perform well without properly maintained Fuel, Air, and Ignition systems. When was the oil last changed? Does the engine have good compression? The hydraulic system needs a clean sump with the proper type fluid. Other items, such as brakes, clutch, and steering, often need some work. 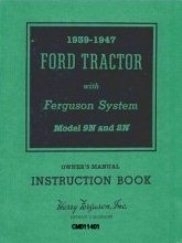 The best source of maintenance and repair information is the original Ford tractor Owner's Manual and the I&T FO-4 Shop Manual. Reprints or even originals of both are surprisingly inexpensive and very easy to get. The information I have provided on this website is intended to supplement, not replace what is in the manuals. Warning: A single step like "remove bolt" can sometimes take half a day or more to accomplish. 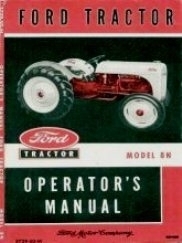 The best manuals are written while actually taking the vehicle apart, but they are always taking apart a new vehicle. Very few step-by-step procedures can include many of the real-world steps that deal with layers of gook, rust, stripped threads, frozen fittings, and previous hack-job repairs. I will attempt to fill in some of the blanks. If you are attempting to bring a basket-case back to life, if your tractor hasn't run in years, is years behind on maintenance, or has been involved in some horrible weather event (like power washing), PLEASE don't just hook up a battery and start grinding the starter. That's a good way to destroy an engine that might have been ok. Remove the spark plugs. Keep them lined up so you know which cylinder each came out of. Look at them. Are they all the same? Search for "Reading Spark Plugs" on the web to find much more info than I have space for here. Pour a little Automatic Transmission Fluid (ATF) in each cylinder. Use about an ounce or so in each cylinder. Just enough to wet the rings. Any brand any type ATF is good for this. If you have no idea about engine condition, check and see if the engine is locked-up. Will it turn by hand? Grab the fan belt and see if you can turn the engine just a bit. The engine should turn fairly easy with the plugs out. If you can move it by hand, twist each spark plug back in a couple of turns to keep trash and bugs out of the cylinders. Let the ATF work in the cylinders for at least 30 minutes. Several hours is even better. While the ATF is soaking-in, check the oil. If it looks bad, or the engine has been sitting for several years, change the oil and filter. If all seems ok so far, remove the plugs and wet the cylinders with ATF again. Leave the spark plugs out and crank the engine. Listen for the compression strokes and for any expensive noises. If all is well, check for oil pressure on the gauge. Now would be a good time to run a compression check. You should have heard the cylinders go WUFF, WUFF, WUFF, WUFF out the spark plug holes, in sequence, while cranking. You could use your finger, but a compression gauge is a lot more accurate. Place over each spark plug hole and record the max compression for each. Once again, if you search for "compression check" you will find a lot more info than I can put here. Anything above 90 PSI is good and the cylinders should give an equal reading, within about 10%, or so. It's a tractor, not a dragster, so don't get too excited if a cylinder is a little low. If one or more cylinders is way low, you may have broken rings or stuck valves. This needs to be fixed before we go any further. So, you hear a tapping, banging, squealing, or other noise but cannot pinpoint exactly where it is coming from. Before doing any WORK on the vehicle in question, here is a quick way to find out where the noise is coming from. Some people have those mechanics stethescopes. The same type of thing the doctor uses to listen to your heart. Any long-handled tool will work much the same way as that fancy steth thingy. I often use a long screwdriver to locate the source of odd noises. ALWAYS BE CAREFUL AROUND RUNNING MACHINERY! Hold the end of the screwdriver blade on your generator, water pump, governor, and various locations on the engine block. At each location, rest the handle against your ear. You will be able to quickly pinpoint exactly where the noise is coming from. BE CAREFUL! Don't get that screwdriver or any part of your body tangled up in the fan belt, other moving parts, or exposed electrical terminals. You could buy a real mechanics stethoscope, but why spend money if any long screwdriver, broom handle, or similar object will accomplish the same thing for free? The N-series tractor Owner's Manuals say to use straight 30-weight motor oil when the temperature is above 90-degrees, 20-weight for all temperatures between 10 and 90 degrees F, and 10-weight for temperatures between minus 10 and plus 10. Modern multi-Grade, high-detergent oils did not exist when those specifications were written. The oil sump and pickup were designed to allow dirt and sludge to collect in the bottom of the sump. That was normal for the non-detergent type oil that was commonly used. Modern Multi-Grade detergent oil has been engineered to keep dirt in suspension, so the filter can collect more, and what remains in suspension comes out more easily when you drain the old oil. With reasonably frequent oil changes, this essentially eliminates the need to flush and clean the sump before adding new oil. Since the lightest weight oil Ford recommended was 10-weight, I normally look for a 10-30 or 10-40 multi-grade for year-round operation in Central Virginia. What follows are some of the facts and circumstantial evidence being circulated by both sides of this issue. Draw your own conclusions. Zinc dialkyldithiophosphate (ZDDP) has been the most common anti-wear additive in motor oil. ZDDP zinc-phosphorous compounds can provide anti-wear protection, help minimize lubricant breakdown, and provides extreme-pressure protection. As engine horsepower levels increased thru the 50s and 60s motor oils were developed with higher levels of ZDDP. This was not for increased wear protection, but to reduce oxidation caused by higher operating temperatures. Then thru the 70s and 80s catalytic converters appeared, and had problems with high levels of phosphorous in motor oil. Reducing phosphorous was necessary so catalytic converters would operate correctly and last. As levels of ZDDP in motor oils were being reduced, flat-tappet camshaft failures increased. Was this a coincidence? That question is the root of this controversy. Documented cases of actual camshaft failures showed at least 25% of the failures were directly caused by improper break-in procedure or low quality parts. Some Camshaft manufacturers had production issues that just happened to occur in the same time period. Many engine rebuilders and camshaft manufacturers have published numerous tech bulletins recommending using high ZDDP assembly lube and an oil additive with high levels of ZDDP with flat-tappet camshafts. In response, oil industry sources pointed to the API tests that did not reveal any significant wear with the newer motor oils. However, those same API tests only used low horsepower engines, at a steady 3600 RPM, regulated load, and constant oil temperature. Those tests would not represent real-world operating conditions for most engines. All motor oil standards are specifically designed for current new vehicles, with some backward compatibility for older vehicles. We have to be aware that "older" in these terms means 10 years or so. Compatibility for engines more than 25 years old is not guaranteed. Modern motor oil formulations are far superior to any motor oil that was available when these engines were new. The N-Tractor engines are low horsepower, low compression, low RPM industrial engines. The N-Tractor engines use very low valve spring pressures and conservative cam lobe profiles. Even if lower ZDDP levels did contribute to camshaft failures for high horsepower - high RPM engines, these tractor engines would NOT have similar failures. In an attempt to find something with additives most appropriate for my antique tractor engines, have used some of the "off-road" and "racing" motor oils. Unfortunately, some racing oils do not have sufficient anti-corrosion additives for engines that sit for long periods. Racing oils are generally formulated with the assumption they will be changed much more frequently than the oil needs to be changed in a tractor. The climate in Central Virginia is fairly mild, with winter temps that only occasionally dive into the single digits. None of my tractors go anywhere when temps are in single digits. I'm going to be as close as I can get to a fully-loaded wood stove. We do get some spells when temps can stay below freezing for a few days. Multigrade, 10W-30 or 10-40 provides the best year-round protection. For rebuilt engines, use lots of assembly lube with high levels of ZDDP. Change motor oil soon after initial break-in to remove assembly lube and anything else that may have been in the engine. A rebuilt engine should be thoroughly cleaned prior to assembly, but there are lots of nooks and crannies in there. Change motor oil again at the first sign of "color". The oil filtration on these tractors is a partial/filtration system. Oil from the pump goes directly to the engine bearings, with a portion of the flow being bypassed thru the filter. There is nothing inherently wrong with a canister type oil filter. New filter elements and gaskets are still available and inexpensive. Some modern cars have gone back to just replacing the filter element. That likely has more to do with reducing cost (and landfill waste) than performance or efficiency. There is a novelty to changing just the filter element. Don't forget to check the gasket that goes under the head of the bolt on top! That will make a huge mess if either gasket is cracked or missing. Unfortunately, replacement canister filter elements are subject to the same reduced quality we are seeing for most replacement parts, and there are only a few options to choose from. There are many more options for spin-on filters, so it may be easier to buy high-quality replacement filters. A few years ago the only adapter offered has the spin-on filter turned sideways. One of the main reasons for installing a spin-on adapter would be to make less mess changing filters. There is a vertical type adapter now. 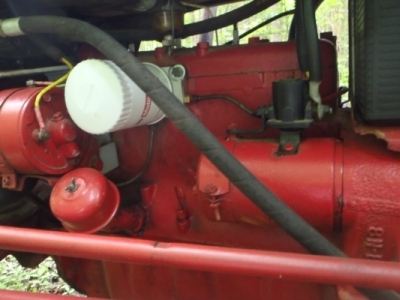 The filter on the three-cylinder Ford tractor engines built in the 70s was installed sideways, so other than the mess that shouldn't be a problem. The recommended Motorcraft FL-1A spin-on filter does have an anti-drainback valve, so once the system has pressurized the filter, oil should stay in it. Rather than being more convenient, the sideways spin-on has proved to be much more of a mess to change. Adding various options and accessories to my 8N Tractor has been fun. This spin-on adapter may have been a case of looking for something else to add, for no good reason. In all honesty the sideways spin-on adapter has not been an improvement. WARNING! The low oil pressure issue mentioned above could kill your engine. If there is a noticable drop in oil pressure after installing any spin-on adapter, do not use the tractor until the problem is fixed. The original filter system restricts flow, so there is plenty of pressure to the engine bearinge. Some of the spin-on adapters may be too free-flowing. The Best Oil Filters - Buy replacement canister filters from a reputable seller like just8ns.com. For spin-on filters I just use the Motorcraft FL-1A. HYDRAULIC FLUID: Refer to the new section on Hydraulics. The original spec calls for Champion H-10 plugs. After extensive real-world experience, most owners of these tractors are using Autolite 437 plugs. These run a little hotter and stay cleaner than the original plugs. Yes, you could simply go one heat range higher and stay with Champion plugs. That should accomplish the same thing. If you are doing a full restoration you may want to use the exact original plugs. It's up to you, but I have been using the Autolight 437 plugs and have almost never had to remove and dry them off to get my tractor started, even when flooded. If you use the choke at all, you will occasionally flood one of these tractors. Most of them are incredibly easy to flood. It only takes a little too much choke. With some plugs, your only option at that point is to remove them and dry them off or put in a dry set. The best way I have found to dry and clean plugs is to cook them a little with a propane torch, then blow the soot out with compressed air. Don't melt them down, just cook off the deposits.